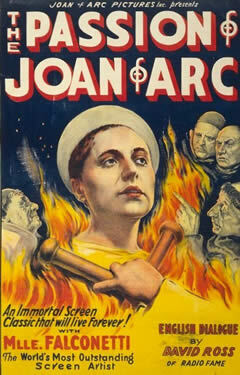 While The Passion of Joan of Arc is not my favourite silent film, it may well be the finest of the silent era. Although I'm always dubious to hear the term "perfect" used to describe any movie - in this case, it seems appropriate. Notwithstanding Maria Falconetti's incredibly moving performance, Dreyer's ability to slowly build the film's intensity, and the beauty which is captured with such simplicity in set design, is wondrous in comparison to the majority of the productions of his day. I first watched this more than 20 years ago, and despite having seen countless other 'classics' since then, my opinion of JOAN OF ARC hasn't changed: it is perfect cinema. When talking about other movies I love, I often hedge a bit by calling them 'one of my top ten' or 'one of my top five'. But I've never had a problem calling JOAN OF ARC my single favorite film of all time. @Klaus: Your point of how Dreyer "slowly builds the film's intensity" is well taken, and what I find amazing is how he does so while relying so heavily on the actual transcripts from Joan's trial. It truly is a work of genius. @Ian: I absolutely agree with you, and I also occasionally do the same thing when talking about my favorite films (using terms like "one of my favorites"). As far as silent cinema is concerned, however, JOAN OF ARC is at the top of the list.